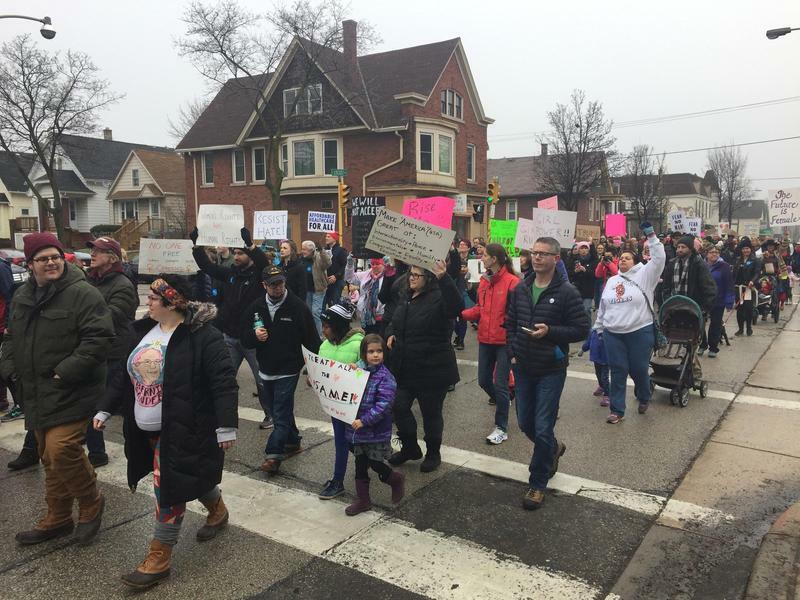 Demonstrators march through the streets of Milwaukee's Riverwest neighborhood. 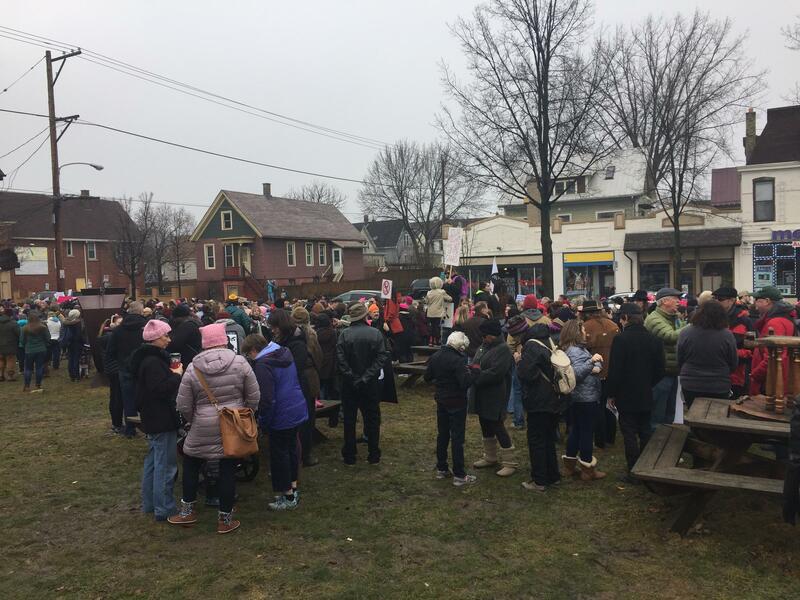 Demonstrators gather near the Riverwest Public House. Laurie Dantoin traveled to Milwaukee from Kenosha to participate. She shared concerns about Trump's ideas regarding the environment, women's rights and public schools. "I don't usually go to these kind of things, but I feel that we need Mr. Trump to see how many people are out there, and to keep in the back of his mind that at any time, any of these decisions he makes, we could do this again. I think he's thin-skinned enough, and does actually care about whether he's liked or not, that this will have an impact on him," Dantoin said. Rain fell as people gathered in Red Arrow Park on Friday evening. 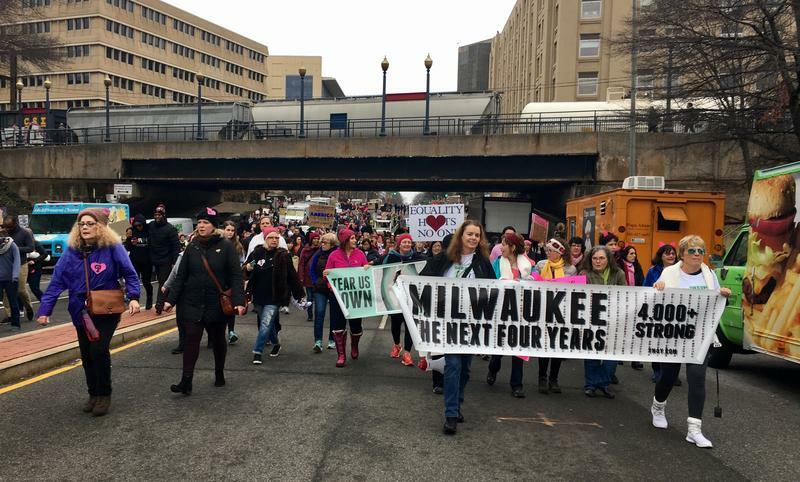 Red Arrow Park in downtown Milwaukee was the gathering spot late Friday, hours after Donald Trump took the oath of office. 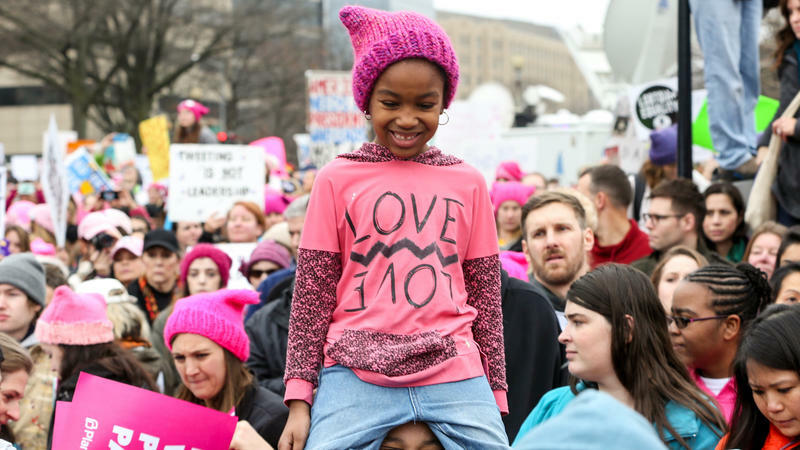 Advocacy groups launched what they say will be ongoing protests against administration policies and rhetoric that don't respect the rights of women, immigrants, people of color and others. Demonstrators sang "This Land is My Land, This Land is Your Land" and promised to fight from the grassroots level through rallies and marches, as well as via social media, to rouse citizens to fight for equal treatment of all people living in the U.S.
"I'm here because I don't trust someone in the White House who doesn't have any political experience and has shown great discrimination toward minorities, women, LBGT people, and I think someone in the White House who is not going to represent all the people is not someone who should be representing our country," said Cole Winston. People were cheering and clinking champagne glasses Friday morning in Waukesha County, as Donald Trump was sworn-in as the nation’s 45th president. 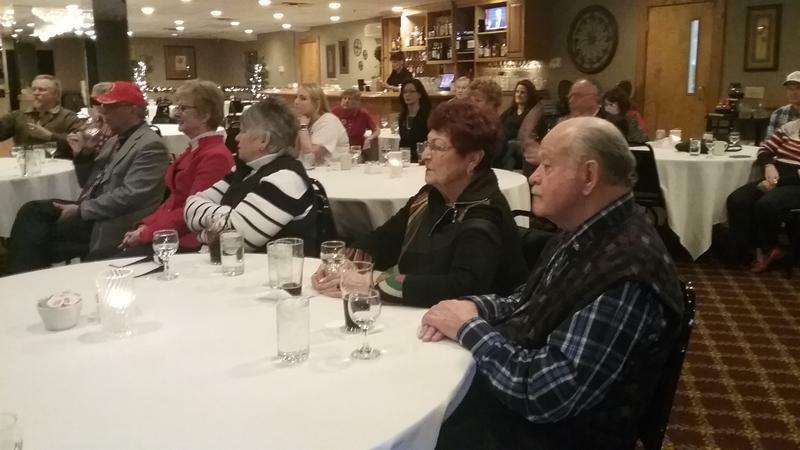 We caught up with Republicans in Delafield as they watched the inauguration ceremony unfold. About 25 Trump supporters gathered for a watch party at the Delafield Brewhaus. They let out a holler when the oath of office ended. After the inaugural address, the partygoers helped themselves to a buffet.